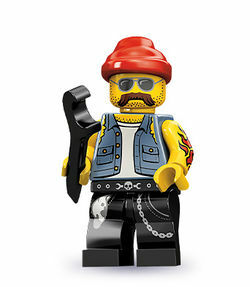 Motorcycle Mechanic is a Minifigures Series 10 minifigure released in May 2013. The Motorcycle Mechanic has black legs, a black waist, a sand blue torso, yellow arms, and yellow hands. His leg features printing depicting a grey chain draping down on the left, and an oil rag on his right. Printing on his torso depicts an unbuttoned, sleeveless, sand blue vest with pockets and a white tank top underneath. Small sections of his arms and hairy chest are visible on the sides and top of the torso respectively. On his left arm he has a red flame tattoo for printing. The Motorcycle Mechanic has a yellow-coloured face, and printing depicts light-grey glasses with dark-grey frames that his eyes are not visible through, a brown mustache, and sideburns. He also has a red bandana. In preliminary images, he had a Mohawk hair piece that was used by the Punk Rocker and Drummer, but in Black. This piece actually belonged to the Tomahawk Warrior, another minifigure in the same series. His left arm printing (Flame tattoo) is similar to Rex Fury's in LEGO City Undercover.